View of the Hayden Station Coal Plant from the front pastures of The Carpenter Ranch, a Nature Conservancy site. I spent the month of September 2015 and two weeks in January 2016 as an artist-in-residence on the Carpenter Ranch, a working cattle operation and conservation site in the northwestern reaches of the Colorado Rockies. The Nature Conservancy, one of the co-sponsors of my stay, bought the property twenty years ago with the goal of protecting two things simultaneously: the cultural heritage of the ranch and the rather rare example of riparian forest shouldering the stretch of the Yampa River running through the property. Because so much of my current photographic work explores the intersection of human institutions and wild nature I was thrilled to have the chance to work in a landscape where that subject is a central focus. Below you will find a little story about my time working on the ranch should you care to read it, or if you want to skip forward to the pictures you can find them in my portfolio The Industrial Pastoral. During my first week on the ranch I launched my Go Pro on a kite almost every afternoon, walking the property from south to north, from the ranch entrance out on Highway 40—just across from the Hayden Station Coal Plant—all the way down to the Yampa River. The aerials were artless—I’ll be the first to admit that—but from the air it was easy to see what the ranch managers Geoff and Betsy Blakeslee had been telling me about a crucial decision the ranch's earliest owners had made almost a hundred years ago: they fenced off the forest so the cattle couldn’t graze all the way down to the river, and now the Yampa Preserve is something of an ecological time capsule. In the aerials of the pastures there is a stark portrait of what happens when land is subjected to repetitive, singular use: the emergence of an eroding, botanical monoculture. 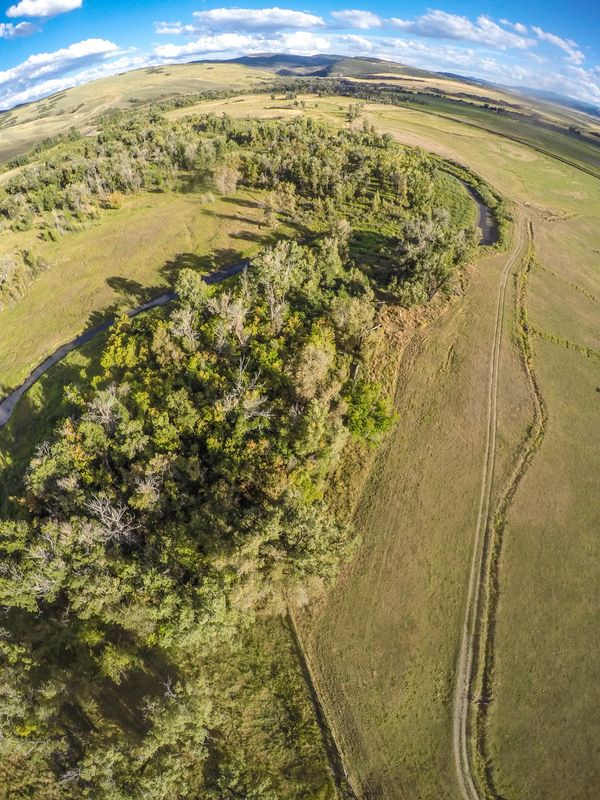 In the aerials of the preserve, on the other hand, there rolls into view a sprawling tangle of marsh and meanders and gravel bars and dense trees, cottonwoods, box elders, red osier dogwoods—all of which are home to a multitude of plant and animal species. The line between these two worlds was at times as thin as the strand of barbed wire that keeps the cattle from roaming. To cross over the fence and step from the pasture and hayfields into the preserve is to become a time traveler. Deep in the preserve you didn’t have to imagine what the forests of the Yampa Valley were like a century ago because you were actually already there. At day’s end I would bring the kite down and set up my better cameras. The late summer river was shallow so I decided to work some in the water, wading in up to my hips with my camera to wait for nightfall. Some nights I stood in the water for hours, enjoying the subtle changes dusk brings, the fish and the bats feeding all around me, lapping up the last insects of the summer, the beavers trolling the water, slapping their warning against my occupation of their territory. Some nights they swam so close and chattered so aggressively I would sing songs to establish my position in what I hoped was a calming manner--which seemed to work, a little anyway. Every time I belted out some new improvisation, lyrics describing what I was seeing around me to the tune of a lullaby, the beavers quieted down and swam away. Mostly though I stood as still as I possibly could to diminish the visual evidence of my presence in the water, and I watched and waited for everything and nothing all at once. Almost every night the elk came trumpeting through the trees, crossing the river very near to where I stood. The coyotes were a constant presence, calling out every so often about what sounded like lots of little indecipherable emergencies. I heard the whoosh of a very large owl swooping low over me one night and looked up just in time to see its wingspan almost as wide as I am tall gliding away on a plank of moonlight. It was there on a bend in the Yampa River that I plugged in to one of the things I love best about the wild world, the wildness around me as it intersects with the wildness inside. The events defining the day's end occurred with astonishing precision and predictability. I found myself rushing down to the river every afternoon so that I could be at my station in the water before what must have been the last heron of the summer came flapping blue and low up the river. Every day at almost the exact same time he made a wide low circle around me as if to lead my eye away from the tree where we both knew he was headed: a giant cottonwood that was home to a heron rookery with at least five huge nests--all of them empty for the season save for the one he still occupied. After the heron, a sequence of migratory birds arrived each night to take shelter in the trees and shrubs and shallow waters of the conservation area. They came in groups and pairs, ducks and geese and starlings, each species like a number on a clock announcing the hour as the sun slipped lower and lower below Wolf Mountain. The sandhill cranes were always the last to land, slipping in under cover of darkness to wait the night out in the shallows of an island down river. I stayed later and later in the water each night, letting myself photograph everything and nothing, the birds, the sun setting, the rising of the darkness. I still didn’t know what the subject of my work on the Carpenter Ranch would be, and I figured I should at least keep shooting so that I might get lucky finally. There is always the danger when working in a beautiful place like the Yampa River that you will become so enthralled with the beauty that you stop seeing with your own mind and instead just surf the wave of sentiment that informs the best clichés. I’m weak like that. I never met a sunset I didn’t like, and shamelessly I made one sunset image after another standing there in the water, pictures I mostly intended to throw away (or keep in a secret file somewhere for personal use), but for one interesting thing that kept occurring. I soon discovered I really had to struggle to take a picture of the Yampa at dusk that didn’t have contrails criss-crossing the sky. That worked for me technically as my work is all about human inscriptions on the wild, but I was curious if the planes were always there or just present at the end of the day. I photographed on past dusk and into the full darkness and always the story was the same: frame after frame was marked by the passage of planes, the white lines giving way after dark to blinking red navigation lights. Route 40, I decided, must have been an important flyway in its own right. Like the birds, so went my own kind. It was in those darkest of hours, when I was waiting for the air traffic to die down a little, that my true subject came slicing toward me out of the blackness. I had turned my tripod toward the east to make a picture of the river looking toward Steamboat Springs. Sometimes the lights of the city, which was twenty miles away, rode the clouds above the mountains, a pink cap over the abyss in which I was floating, but that night the sky was black and for the first time I wasn't distracted by the ambient glow of distant cities. That's when I noticed that the tree with the heron rookery was veiled in feint orange light. The nearby trees were dark, which made me think at first that I was imagining things. I blinked. It was still there. I took a picture. Inside my camera what was a shimmer became a blaze. The longer the exposure, the brighter the fire. I walked down river to stand directly across from the tree, and it was then that the light source became obvious: the Haden Station Coal plant over a mile to the south was beaming its light across the ranch, down through the forest, and over the river. Local residents are quick to tell you Hayden Station is an important employer in the county, and the people who work there, the people who are directly and immediately dependent upon it, tended to post signs throughout the valley featuring an illustration of a light bulb and this message: Coal, It keeps the Lights On. And indeed, at least in Colorado and a few other places, coal does keep the lights on and the house warm and the refrigerator humming. I like these comforts as much as the next person, and in my enjoyment of them I fully experience the irony of human ingenuity. We human beings have spent much of the ten thousand years perfecting the boundary between ourselves and wild nature. The drive to survive has become the fenced garden, the walls of the house, the lit night. We just haven't extended that ingenuity far enough or fast enough to adapt our methods to correct the excesses of our success--the population boom, the reluctance to shift to sustainable energy. In the scheme of things you could argue that the absence of natural darkness is a minor problem compared to carbon emissions and all the upheaval that will continue to ensue with climate change. On the other hand, it could be seen as an easy starting point for attempting to reverse some of the damage and reduce our carbon footprint at the same time. All we have to do is turn the lights off—or down—to begin to make a difference. Dark sky advocates and dark sky researchers will tell you that the inordinate illumination of the night is disrupting the natural cycles of many plant and animal species. Sleep researchers emphasize that cyclical doses of pure darkness are essential for the health of the human brain, but on the Carpenter Ranch such darkness proved hard to come by—even deep in the preserve, which was at night less of a kind of time capsule than it seemed to be during the day. What negative changes the artificial light has wrought in that ecosystem I don't know, but I did start to wonder if some of the animals might have been using it deliberately. The heron rookery was built directly in the path of the factory light, in one of the most brightly lit of the trees, and I wondered if they had chosen that tree for to help ward off predators. I began camping down on the river so I could work longer and longer hours. I photographed the cottonwoods glowing in factory light. I photographed the cattle lounging in the brightest part of the pasture. I photographed the plant too from the pasture just across from the entrance on Highway 40, the light of the galaxy rising behind it, and was startled to discover in the foreground later that I had also captured all the eyes of animals living in the pasture--the deer, the fox, the coyote, the rabbits, the barn cats--their eyes were all aglow with the light of Hayden Station.